He did it the Phil Lima Way! The name Phil Lima has been synonymous with summer fun for kids in Stony Point since 1967. 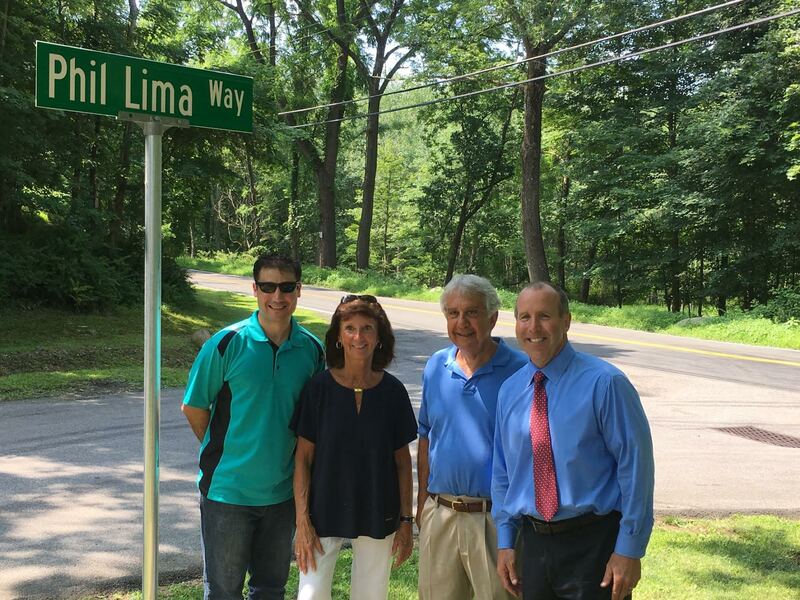 To honor the nearly 50 years of great service to the community at the municipal summer camp, the town dedicated the road leading to the camp as Phil Lima Way. “Phil has dedicated his whole life, together with his wife, Karen, to one of the greatest and most successful camps I’ve ever seen,” said Supervisor Jim Monaghan. The surprise naming of the camp street in Lima’s honor was a bit delayed by the stormy weather over the weekend, but the sun was out Monday, July 18, so that both campers, Lima’s family and the town could recognize his contribution. “I was overwhelmed and surprised, very touching and moving,” said Lima. “Both Karen and I are life members of the Ambulance Corps, and we help out wherever we can. That’s where we met. We were both teachers, Karen is a native Stony Pointer who taught in Rockland BOCES and I taught Social Studies in Suffern High School.” Obviously, this long-married pair has a lot in common and love living in the town. In addition to running the yearly summer camp, Lima and his wife are lifelong Ambulance Corps volunteers (that’s where they met) and have been go-getters for the town since they were old enough to get involved. The kids at the camp—some of them adults now—came and held up signs to thank him for his 49 years of service. Lima may be retiring, but he and Karen are staying put in Rockland’s northern-most town. “We love it here. It’s a great place to live and to raise your children,” said Lima. Congrats and thanks to Phil and Karen Lima!